When I get interested in something, I’m like a dog with a bone. I like to read about it, think about it, talk about it, do shopping for anything I can think of related to it. I was like this about my job before I had kids and it wasn’t one of my husband’s favorite things about me. I would come home and think about work all evening. Thank goodness it was before the days of laptops, email, and smartphones so that all I could really do was think and worry at home, that is when I was able to rip myself away from my desk. Once we had kids, they were easy to think about constantly and I would say that was a good thing. I loved being a stay-at-home mom and I still do. Being with kids all day taught me patience and the importance of napping. There is honestly nothing I disliked about raising my kids and every aspect of it was a blast. Trips to the zoo and the botanical gardens, walks to the park, and reading books are all great things to contemplate day and night. When the kids started getting older and I started running more seriously, I found myself thinking about running all of the time. I liked to think about the logistics of the run, the weather and what I was going to wear. When I started racing, that made it even more interesting and fun to think about. But running for almost nine years is a long time. It is after all, just running. It’s pretty much the same every time and everyone does it pretty much the same way. Put on shoes, flip on some music, get sweaty, and take a shower. What’s interesting about that? Yet here I am at the beginning of another year and I’m just as excited as ever. The Polar Dash Half Marathon is in the bag already and the Rock ‘n Roll Arizona is next weekend. I’m running the half marathon and Mike is running the full. The following weekend is the Frozen Half Marathon in St. Paul. We’ll wait and see what the weather looks like and if it’s not too bad out we’ll go and do race day registration. We are looking at a couple race possibilities for February and we’ll do one of the Lucky 7 races in March. I’ve been running a lot of slow miles to work on my aerobic base and I’ve been biking on the trainer, too. I’m pretty excited about Arizona! I know it won’t be my fastest, but I’ve been running pretty well and I know it will be fun. Sometime this year I would like to run a half marathon in under 2 hours. I’ve only done it once before and it surprised me that I could do it. I’m hoping to run a bunch of half marathons this year, so maybe I’ll get lucky and I’ll find myself doing it again. My number one priority for the year is Ironman Florida, but I would like to do more races this year than I was able to manage last year. Next weekend I’ll be wearing shorts in Arizona instead of being covered in frost. 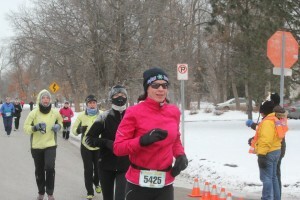 I ran pretty well at the Polar Dash. I finished in 2:03 but the course was a quarter mile short. I should have finished at 2:05 which was fine, so I was disappointed that the course was short. I ran the first 6 miles at a fairly easy pace and then picked it up a bit. It would be great if I could run Arizona with the same finishing time and run faster to make up for the extra distance. Right now the weather forecast looks good. My daughter is saying that she doesn’t feel well and the flu is hitting our area hard, so I’m keeping my fingers crossed that we’ll all stay healthy for another week. So next post will either be as race report or a sick report. I vote for race report! A healthy obsession is a good thing. Great job in keepingit going all these years. I love a good race report. Keeping my fingers crossed for you all! I have that same tendency to get pretty passionate about my…passions Sounds like you have a great year planned! Oh gosh i hope the flu did not show its ugly face and you had a great race in AZ! Happy belated new year! I vote for race report too. I am sure that you will become soon a regular under 2:00 runner. 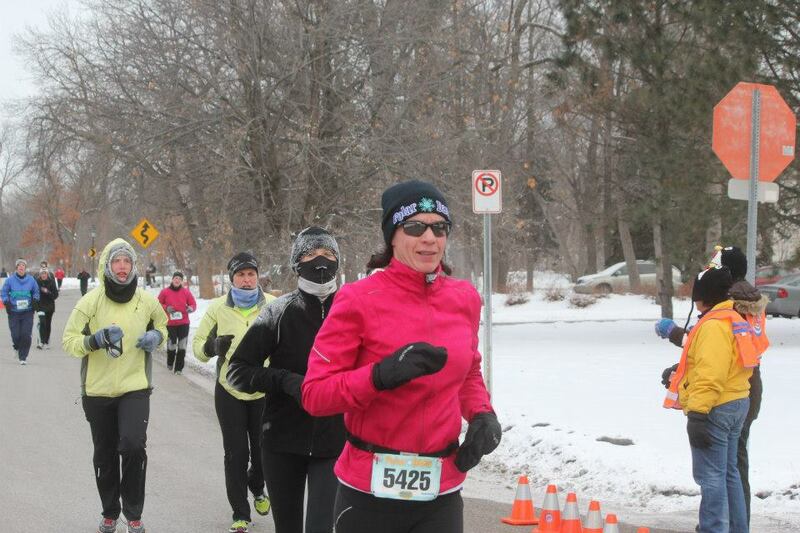 Never raced in such cold weather I would like to try even if now the races are an impossible dream for me.